Just what you need, a nice relaxing day at sea! I can’t for the life of me lie in though, so I’m up, dressed and downstairs in the Atrium enjoying a coffee with James Cusick and Neil. That was about as energetic as my day got. I didn’t fancy laying out in the sun. It was really windy so knew I would burn if I attempted to sit in it. I had a bit of a mooch around and a stroll of the open decks. I like to see what’s what. I even went to the art gallery and studied a bit of art, ooh get me and my cultural side. I have taken an interest in a print, I think they are all prints are they not? So now the art manager is my new best friend. She gave me the artists book to take back to the cabin and browse at my leisure. She really does think she might get a sale. I do like the picture, but at the end of the day it’s only a print, and that’s the bit I can get my head around. It’s a lot of money for a print! I decided to have lunch in the sunshine on my balcony. It was perfect, and I was sheltered from the wind. The sea is a bit bouncy today and we really are rocking about a bit. I could have sat on my balcony all afternoon, it was lovely, but my feet needed elevating higher than the foot stool would allow, and have you any idea how cosy and snug that Sealey mattress and duvet is? I had the biggest of big sleeps, it was bliss. I struggle to get up and out in time to prepare for the evening ahead. Its formal night tonight, so easy pickings from the wardrobe. I’m sure I arranged to meet my boys in Glasshouse but they are missing in action. I nipped out from my spot ion Glass House to do a bit of ‘Theatre Doors’ with Neil and Jo. I think I could get a job doing that, all you need to do is smile, nod, and say Good Evening a few hundred times. I don’t think any of the passengers are any the wiser that it’s not my job anyway. Maybe random passengers could do doors each evening and give the ents team a bit of time off. Me and Jo like to chat dresses in between ‘Good Evenings’ anyway. So, back to my Pellar in Glass House and then the walk all the way aft to Oriental Restaurant to see whats what? Why I am attending I don’t know, but I don’t want to let my boys down, plus I need to tell them off for not being at pre dinner drinks lol. So tonight our table for 8 was down to a cosy table for 2, just me and Chris this evening sat in the corner like two naughty kids. So where is the other part of the gang? I need to call Garry, maybe he is ill? Maybe he has done a runner? Have we killed another table companion? No response from Garry, he must have ran away. We tried to explain to Deepak our assistant waiter that our dining table is like a game of Cluedo and that there is one of them in the library with a dagger in their back, another in the candlestick at their side, but well…. it all went over his head! After dinner Chris was going to watch a film on the sea screen, so I headed to my barstool in Malabar and watched the cabaret. He was very good. I have to say that all of the cabarets in Malabar have been good to date. Kilt stalker man was at the end of the bar thankfully preoccupied chatting with another man, didn’t stop him staring though. Dolly Parton Tribute was on in Manhattan and Chris said he would probably be in there later, so I went down for a nosey. I stood for a while leaning on the pole, but when the man from the end of the bar from earlier slid around it towards me I thought it was time to depart. I’m not really sure where I was going, but I ended up in a quiet dark corner of a bar putting the world to rights with a few old friends over a drink or two. I had a wander back down to Manhattan with Neil but my boys were still missing, so I decided it was time for bed. I don’t think I slept last night, didn’t feel like I did anyway. I was in for breakfast in the Peninsular restaurant nice and early. Nice table for one, just how I like it. No need for a menu, just a cup or tea of tea, glass of orange juice and a plate of bacon, Sausage, well done egg and baked beans. Excellent, best meal of the day. Chatted to a lovely couple next to me. 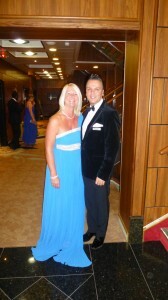 They are off on Queen Elizabeth in January for part of the world cruise sectors, sigh! It made me want to go too. I wonder if I could fit it in!? I had packed my sport billy bag with laptop, iphone, purse and camera so I was ready to go ashore. My poorly feet dictated that I take the water taxi across to St Phillipsburg which is now priced at $7 return/all day pass. It was a large catamaran type boat but hell fire, did I want or need the full on Diamonds International promotion on the big screen and tanoy for the entire journey across. I know now why I usually walk! I had no sooner set foot on dry land than it started to spit with rain, only finely but it was spitting. I had a brolly but at this stage it wasn’t really needed, especially as I was in and out of the shops on the main street. I walked all the way along to The Greenhouse in the hope of a rest and some wifi, but that didn’t open until 11.00am which was almost 2 hours away, so I had a stroll along the prom and came across a nice empty cafe bar. I enjoyed a nice quiet coffee latte and used their wifi. I was happy and content with that but then the heavens absolutely opened. We had thunder and lightning and it wasn’t going to let up. I consoled myself with a mango daiquiri and a little more wifi. It got so bad that we had to have a lock in to shield us from the absolute torrential rainfall. Trouble was it was so busy in there that the wifi became virtually nonexistent. And it was cold due to the rain, so I had to have another coffee to warm up. Eventually it eased enough to venture out. But I will tell you how bad the rain was, even the beach was flooded! 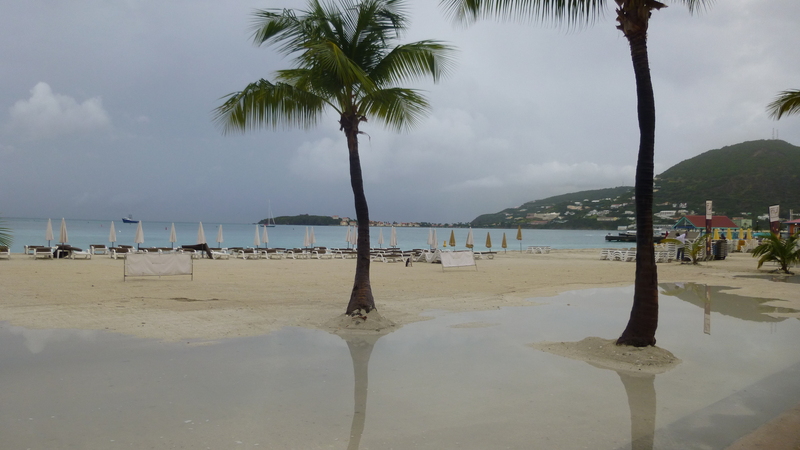 I should have gone and got the water taxi back at this point but no, I was in St Maarten and St Maarten has shops, so I walked them all again. It was warmer and the sun was trying but not quite doing it. 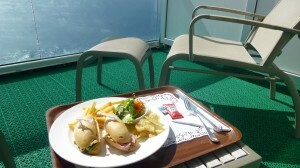 I got back to the ship at about 2.00pm and decided a spot of light lunch might be a good idea. How that light lunch turned out to be a salt rim Margarita and a Cocktail of the day, Caribbean Cruise, I do not know – I blame Chris! The sun was out and nicely on our backs as we sat at Breakers Bar. Oh yes, we were well and truly back in Caribbean cruise mode. I needed a seep after all my excursion to Breakers Bar, and then I had to decide what to wear from tropical night. I’m almost out of long maxi dresses to hide my horrid poorly feet so I will be brave and go for a bright shorter dress in the hope that it dazzles people into not looking at my feet. I’m such a busy little social butterfly pre dinner, it’s difficult to fit it all in but no matter what time I arrive in Glass House Napoleon always has my glass of ice cold Pellar ready for me. I always have someone to chat to, so ladies don’t ever worry about travelling alone, most people are extremely sociable. 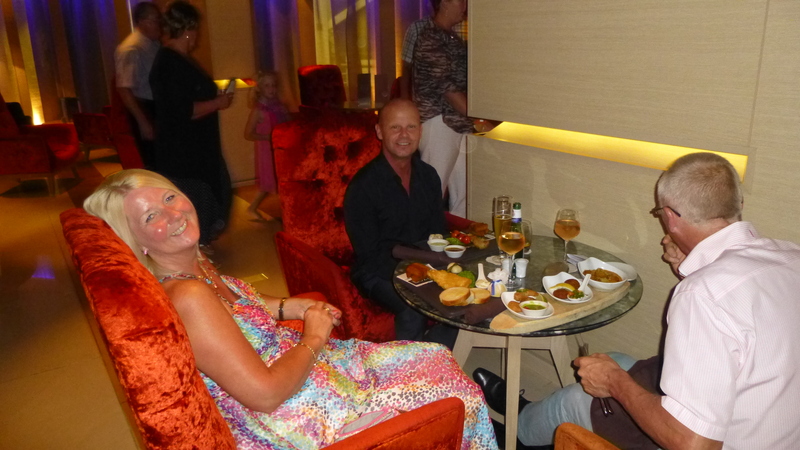 Tonight I was chatting to a lovely couple I often see in Glass House and they were telling me about the rude passengers they have just experienced whilst Freedom Dining. I think we have all experienced similar, but it does make me cross as there is no need. 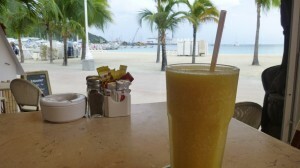 We sailed quietly out of St Maarten at 8.00pm, but we were soon bouncing and hitting holes in the sea. On my way into dinner I drag Garry off his bar stool in Malabar. He said he wasn’t coming to dinner, oh yes he is! I can be such a bully when I want to be. I wanted the chicken Tikka and I needed to make sure I had someone to dine with on our random table of 8 that has been as low as 2 some nights. We all fear it being just one lone diner one night. After dinner the Tropical deck party had been transferred to Manhattan due to inclement weather. That was mega busy so we went to Malabar to watch the cabaret. I thought it was a new singer but it was the same girl we had seen a few nights previous. Afterwards we ventured down to the tail end of the party. Changez had finished but it was still busy. I’ve not quite worked out how we get to be the last to leave from there. We were treated to a compilation of Christmas tunes, oh I was rocking to those. It was 3.00am again when I got to my cabin, I think I’m getting a bit old for this – it’s fun though. 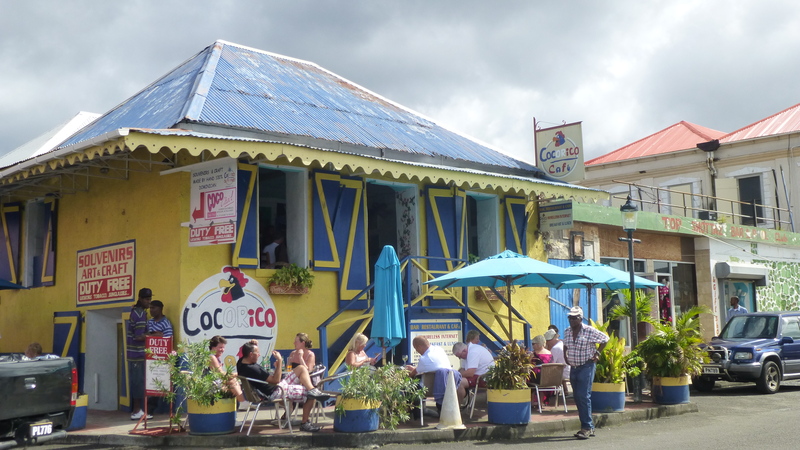 Sunday 8th December 2013 – Antigua, or not as the case may be! Well despite only being in bed about 3 hrs, I was up and ready for breakfast at 7.40am, I must still be tipsy! Breakfast was lovely, but we were already on the second announcement of the day from Captain Paul. Strong winds were preventing us from entering the shipping lane for St Johns, Antigua, so we are having to keep going back around and attempting again. Antigua is one of the only Caribbean ports with shipping lanes don’t you know! Well there was great disappointment buzzing around the dining room, personally if the weather is going to be naff, being in a port serves no great purpose for me. By 9.20 it was announced that the mission had been aborted and Captain Paul would do his best to come up with a plan B and let us know at the noon announcement. My cabin steward had already serviced my cabin before 8.00am and it seemed a shame to disturb the crisp soft white duvet, but I had to. 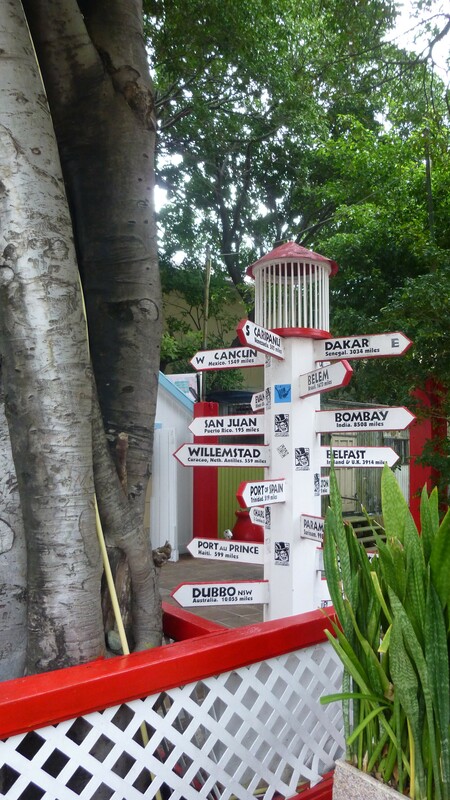 I stirred when it was time for Captain Paul to do the noon announcement and it seems we are off to Grenada, which is fine by me. He doesn’t know when we are going to be there, but today will now be our last sea day and it will be decided which order the ports are in after tomorrow. I got up for an hour and had a potter round the ship. Everywhere was buzzing. There was a great singalong party type event in Malibar, Brodies was packed to the rafters with footie fans glued to the screens., the shops and atrium was busy, Glass House was the busiest I have seen it and all of the self service dining outlets were crammed. There were however quite a few sat outside well under the shelter, some craning their necks to see the footie on the big screen and some I think just tryng to get fresh air in an effort to avoid sea sickness. The thunder and lightening was actually quite scary, I don’t think I have ever heard thunder to loud. 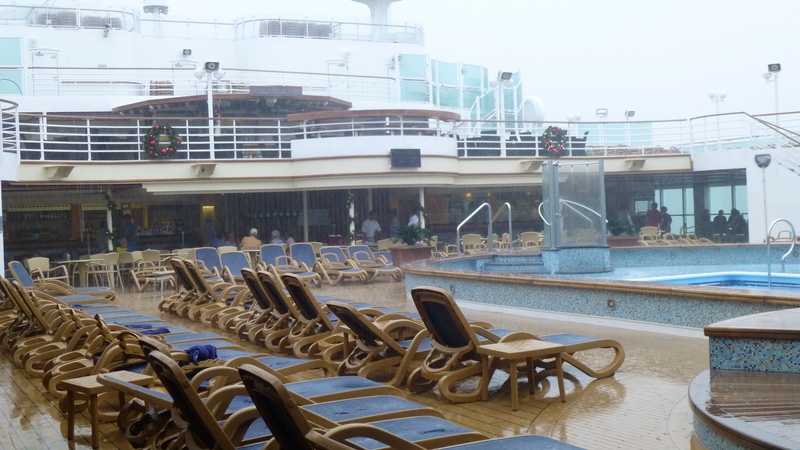 The decks were flooded and water was just washing around my feet like a little river. I had the crispy chicken wrap with ranch dressing again from the grill. The presentation is shocking and the chicken has been nowhere near anything crispy or any dressing. 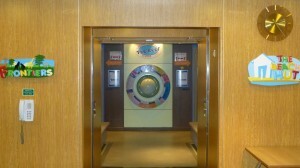 After that I had research to do in the spa and Retreat and also the kids facilities. With that bit of work and research out of the way I took to my bed again. Its hard work this cruising malarkey! I did give myself a bit of a fright when I woke up and looked at my watch upside down and thought I had missed a whole evening. Semi formal night tonight, and guess where Jane will be pre dinner drinking? Oh yes, Glass House! Hey guess who joined me? Garry!! Yay, he is alive and well. We haven’t killed him but it turns out our late nights have randomness have come quite close. He is such a lightweight. If he wants to be one of the boys he has to drink with the boys lol. I have decided enough is enough and I am not going to the dining table this evening, there I have spoken! 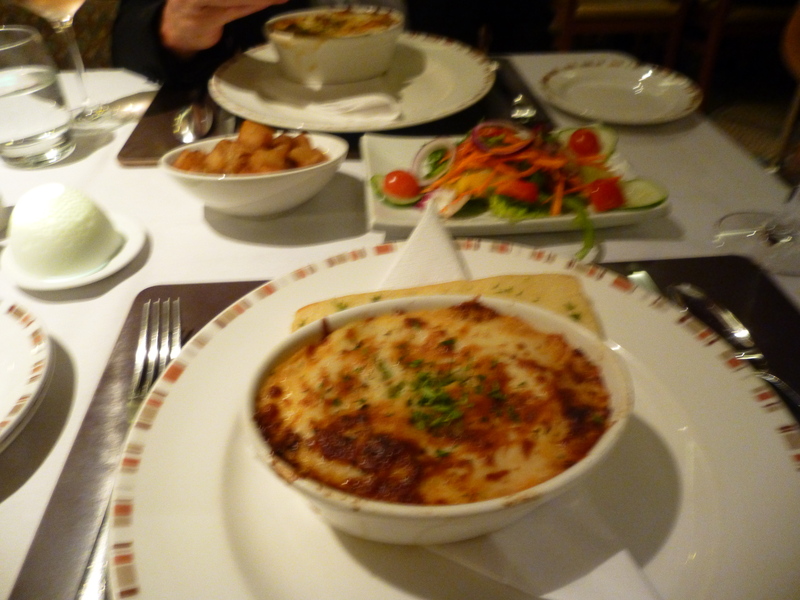 Instead I kidnap Garry and we go to the Trattoria for a change of scenery, good food and of course excellent company. Food was very yummy. 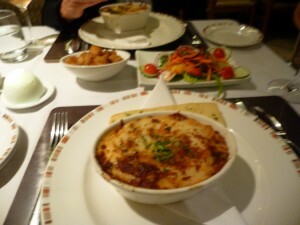 I love the minestrone soup, then I had the lasagne. This caused much debate as the correct way to eat it. I say knife and fork, my dining companion says fork and spoon. 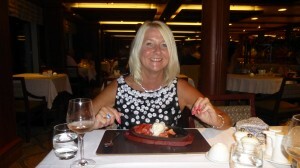 I had to have the sizzling strawberries, its a must for me. They sizzled all the way down the restaurant but by the time they were placed in front of me they had stopped sizzling which caused me great disappointment. We had a lovely evening though and it was all good fun. Kenny Rogers tribute act was on in Manhattan and we met the other half of ‘my boys’ in there. Oh dear, poor Chris had dined alone. It would appear that the other member of our table has left the building and hot footed it to another more acceptable table? Is it us, or is it them? I did feel sorry for Chris though sitting alone for dinner when he could have come with us. He said it was the fastest meal he has ever eaten. But what was going on tonight, before Kenny Rogers had even started Garry had slithered off behind my back and departed for the evening. It would appear he has turned over a new leaf and doing what he set out to do this cruise – have a rest, lol. I had the same idea at the start of the cruise but I think it’s a lost cause now. I didn’t think I would say this but Kenny Rogers was really good. I was having a right old sing along to his songs, which I guess was the point of entertainment – it entertained me! Me and Chris had a few for the road before turning in really a lot later than we should have done. 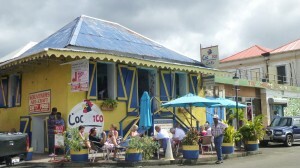 Its quite cloudy today and dull, but really warm, which is what you would expect for the Caribbean. I really couldn’t be bothered with breakfast. I think I left Manhattan a bit late, again! 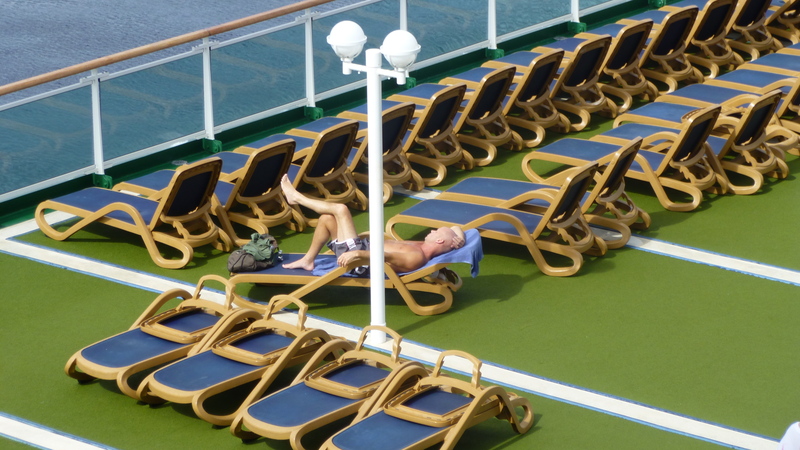 I went for a stroll around deck 16 and found Chris on his sun lounger waiting for the sun to do its thing. Star Clipper and Royal Clipper were out at sea circling each other, so I stood at the rails and watched those for a while thinking how lovely they looked in full sail together. 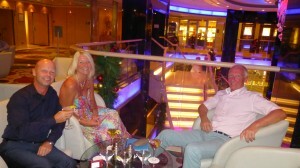 One day I will get back onboard them for a proper holiday. We have at least docked right in the town today so if I do want to go ashore its right on the doorstep. Time for a Costa coffee in the Atium. Today I am joined by Captain Paul. Oh it does amuse me how people try to sidle in on the chat. Err Hello, this is a private conversation! Just because he is the Captain doesn’t make him public property. Captain Paul is very good with the passengers though. Captain Paul assures me it will brighten up later and he wasn’t wrong. I decided to get my ipad and go ashore in search of some wifi. Oh heck it was hot, and after a night out in Manhattan there is only so much of the taxi touts and stall holders that I can take. I found wifi but I’m too irritable to do battle with it to stay on it, so I give up and nobody at home got a skype call from me again today. The wifi just wasnt that good and my patience was nonexistent. Back on board the ship was pretty much deserted, no problems finding a sunbed today! I disturbed Chris’s peace for a while and then I went and disturbed Garrys. He needed a ticking off for slithering out of Manhattan last night without saying goodnight. It was baking hot by now so I got changed and laid on a sunbed, observing others from the comfort of behind my sunglasses. It has been decided that we are dining in Glass House tonight. That’s a date then, my boys are to meet me sometime after 7.30 at my Glass House bar stool. They didn’t let me down, I think they know better than that now. We had a lovely relaxed meal and I could have sat there quit happily all evening in my big orange chair. But my boys needed to see what was what. We did something a bit random tonight and moved onto Blue Bar for post dinner drinks. Can you believe it is the first time I have been in here this cruise. 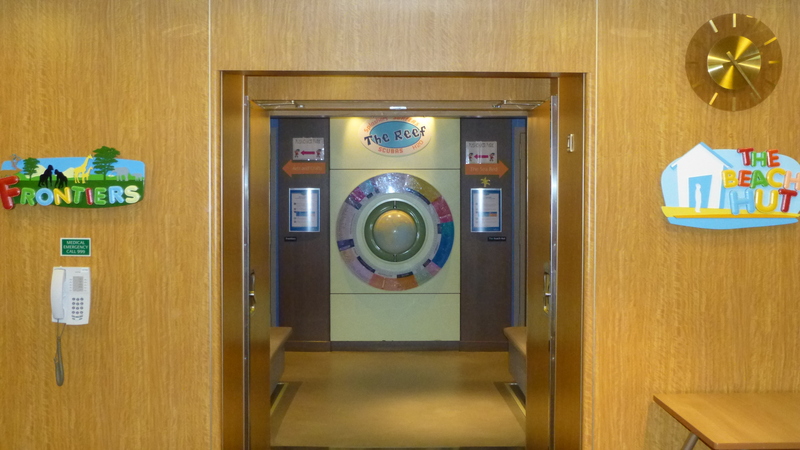 it’s usually my favourite bar, but just not found the time this cruise. 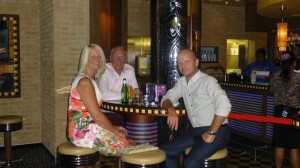 We had the ‘hand shaken at the table’ martinis, which of course they were not shaken at the table! They never are, in the words of a waiter last Caribbean cruise ‘they are just P&O words madam’ we had a giggle as usual though and for some reason I have to drink the boys drinks tonight. They order ones they don’t like, try mine and decide mine is better, so I do the polite thing and let them swap, I guess their research of P&O drinks menu is not as extensive as mine, so I have to make allowances. Chris wanted the James Bond Martini, but he didn’t like it lol. Guess who had that one then? No evening would be complete without a visit to Manhattan, and guess what? My boys are ordering drinks they don’t like again and I’m drinking them!